The Florida Chapter of the American Academy of Pediatrics awarded Jeffrey P. Brosco, M.D. Ph.D., professor of clinical pediatrics and associate director of the Mailman Center for Child Development at the University of Miami Miller School of Medicine, with the 2018 Audrey Lincourt Schiebler, FAAP, and Gerold Schiebler, M.D., FAAP 2018 Advocacy Award. Jeffrey Brosco, M.D., Ph.D., with FCAAP President Madeline Joseph, M.D. This award is given annually to a physician who has worked beyond the profession, educated local and state legislators, and diligently advocated to improve the health and welfare of Florida’s children. Dr. Brosco was recognized for his work as the Deputy Secretary of Health for Children’s Medical Services. In this role, Brosco oversees programs such as Florida’s Child Protection Teams, Early Steps, Newborn Screening, Poison Information Centers, and a managed care organization for 62,000 children with special health care needs. For the past 22 years, Dr. Brosco has served the Miller School in several capacities, including as director of faculty education development in the Department of Pediatrics and director of the Leadership Education Neurodevelopmental Disabilities Program. He is also the chair of the Pediatric Bioethics Committee at Jackson Memorial Hospital and director of Population Health Ethics at University of Miami Health System Institute for Bioethics and Health Policy. Dr. Brosco graduated from the University of Pennsylvania with a degree in history and sociology of science in 1985. In 1992, he earned his M.D. from the University of Pennsylvania School of Medicine, completing his residency in pediatrics at Jackson Memorial Hospital. He completed his Ph.D. in history and sociology of science at the University of Pennsylvania in 1994. Dr. Brosco continues to teach and practice both general and developmental pediatrics at the University of Miami Health System and Miller School of Medicine. He has published more than 100 articles in scholarly journals and periodicals, received millions of dollars in research grants, and presented countless lectures, presentations, and talks on a variety of topics ranging from the history of 20th century health care for Philadelphia’s children to pediatric bioethics. On a national level, Dr. Brosco chaired the Newborn Screening Translational Research Network and serves on the Advisory Committee on Heritable Disorders in Newborns and Children, as well as the National Workgroup on Standards for Systems of Care for Children and Youth with Special Health Care Needs. 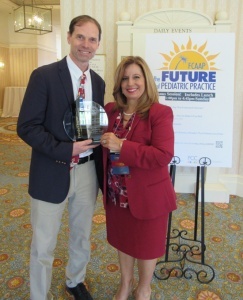 The 2018 Audrey Lincourt Schiebler, FAAP, and Gerold Schiebler, M.D., FAAP 2018 Advocacy Award was presented to Dr. Brosco at The Future of Pediatric Practice conference on September 1 at Disney’s Grand Floridian Report and Spa in Orlando, Fla.